We got the chance to welcome the mare ZBS Beethoven's PokerFace in our stable. A daughter of the well-known Indian Peaks Buck's Beethoven who has collected countless Champion titles in the USA and Europe, including WORLD CHAMPION at the age of two and several times RESERVE WORLD CHAMPION. Beethoven is the maserati under the miniature horses, a real mini-Thoroughbred horse with many race and nobility. He was imported to Europe and has an even successful showcarreer overhere. PokerFace herself certainly got the looks of her sire, she inherited everything that was needed in that small body and is certainly all "horse". She carries her wonderful head on a beautifully balanced neck, she has a good top line and shows herself very graceful and elegant. She knows how the use her very elegant legs and therefore her trot and smooth movements are spacious enough for the perfect image that we want to see in a miniature horse. With this mare we really have a showtalent, we are quite pleased with her and hope to participate in shows with her and with her future foals. 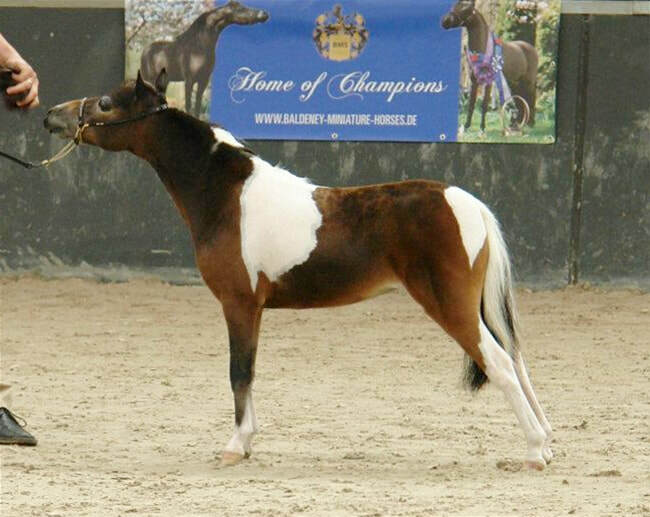 With such a pedigree and charisma she will definitely be a eye-catching horse for the public.